Discover some amazing modular kitchen designs photos that will help you plan your kitchen better and give you ideas on how to go about its interiors. Modular kitchens give a chic glamorous look to the cooking area. They are smart, comfortable and are highly efficient. In modular kitchens there is proper use of space, they have a compact design and ample storage facility. 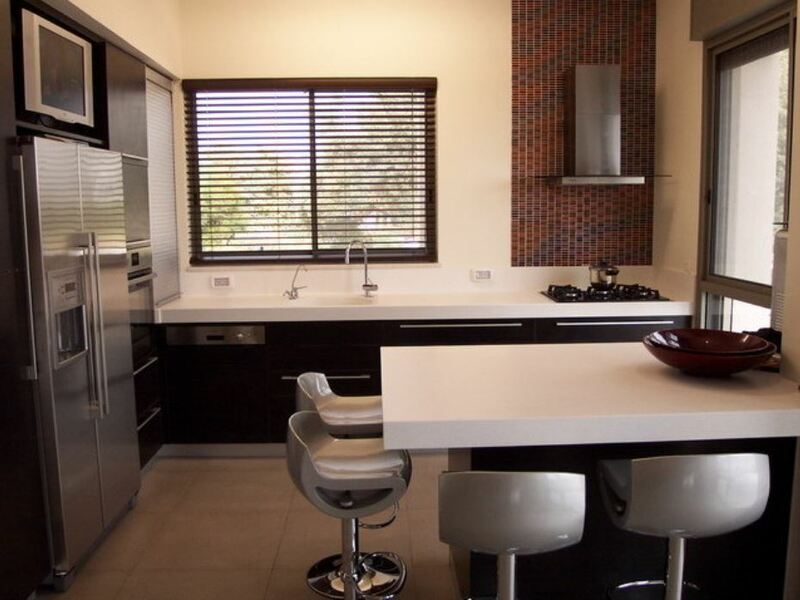 Here are some fabulous modular kitchen designs photos to give you wonderful kitchen ideas. 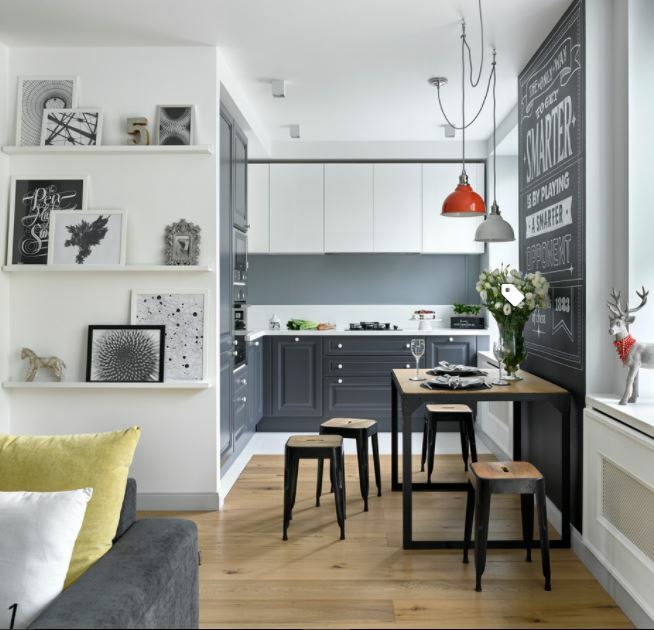 These modular kitchen designs photos boast of a perfect layout. The combination of the dark cabinets with white counter top is beautiful. I like the glass bulb pendants hanging over the peninsula. Crown molding up to the ceiling gives a smart look to the kitchen. Modular kitchen designs photos like these give us an insight to an organized kitchen. This kitchen design has epitomized happiness. The kitchen has good storage capacity. Its ‘U’ shaped kitchen platform gives a comfortable working space for the lady of the house. The little splash of greenery enlivens the atmosphere. 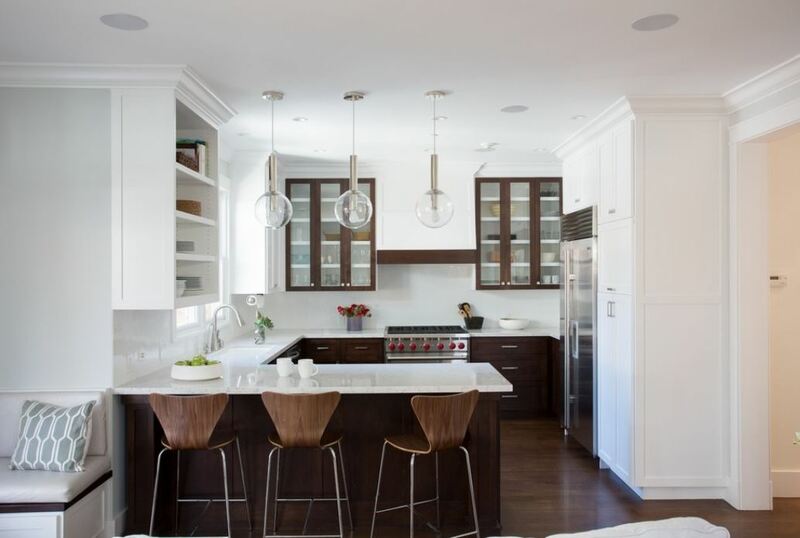 Brown predominate the color tone of this kitchen. It is a warm welcoming color. This small kitchen neatly packs in all utility at one place. The blinds on the window allow the insurgence of enough sunlight to give a fresh feel to the room. The kitchen table looks inviting for a sumptuous meal. This kitchen area provides a place to gather while cooking and entertaining. The small sit out attached to the kitchen makes it look more spacious. Huge glass windows and door allow the flow of natural light and air. 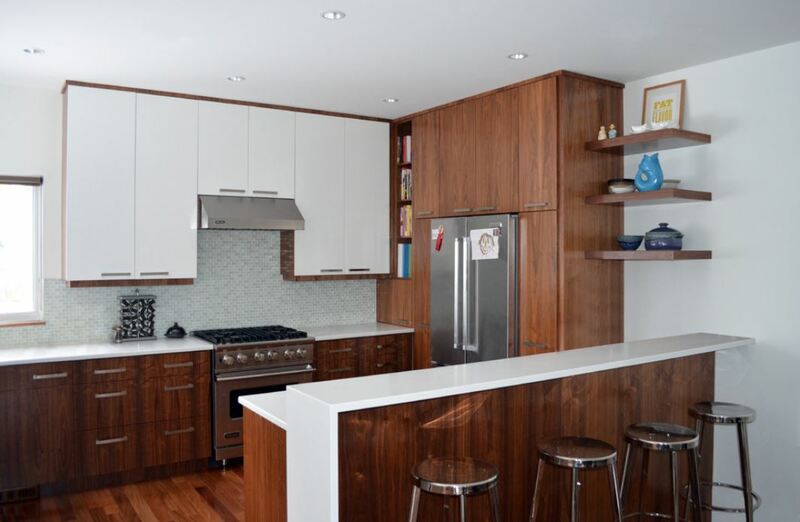 The kitchen also flaunts of a good storage capacity and excellent wood work. This tiny little kitchen is designed in a very systematic way. It has a small breakfast nook to bind the family together over a cup of coffee. The subtle ensemble of grey and beige plays magic in here. 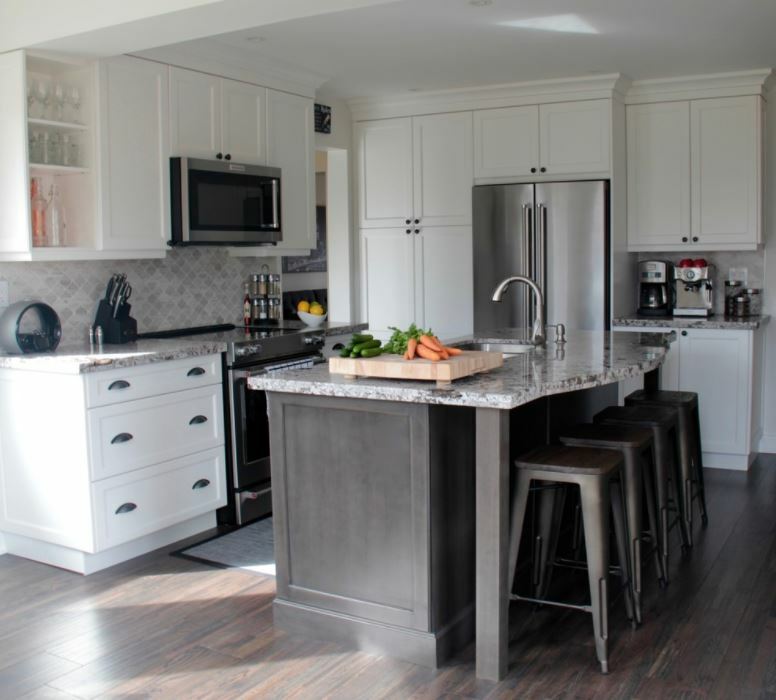 Grey is a cool and neutral color that extends calmness and happiness to this kitchen. This is a simple working kitchen wherein everything is designed keeping the convenience in mind. 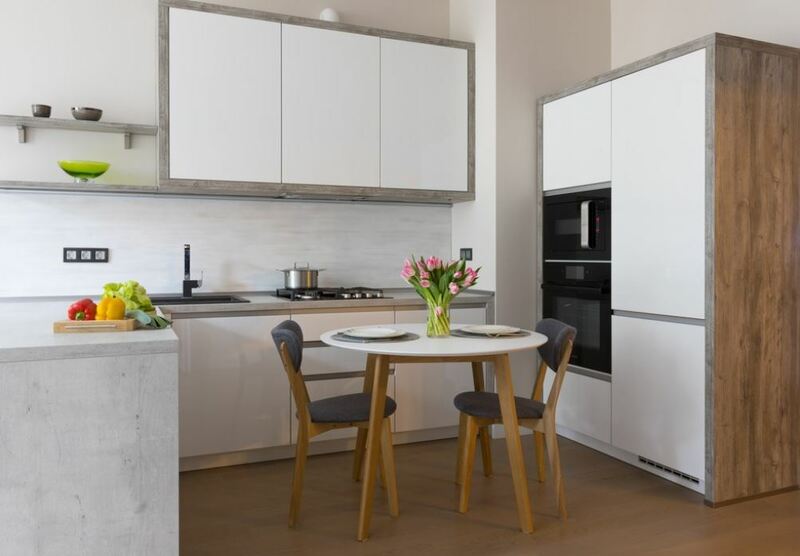 It has a compact design with white cabinets, floor, ceiling and walls. The countertop consists of honed flamed granite. I like the backsplash behind the gas stove. The cabinet above the fridge looks quite attractive and handy. Everything looks in harmony with each other. 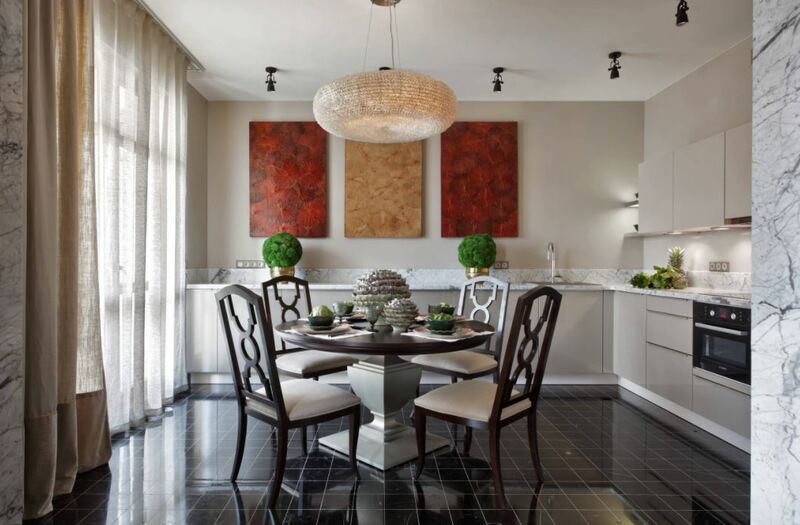 This kitchen design blends seamlessly into the small dining arrangement and then the living room. 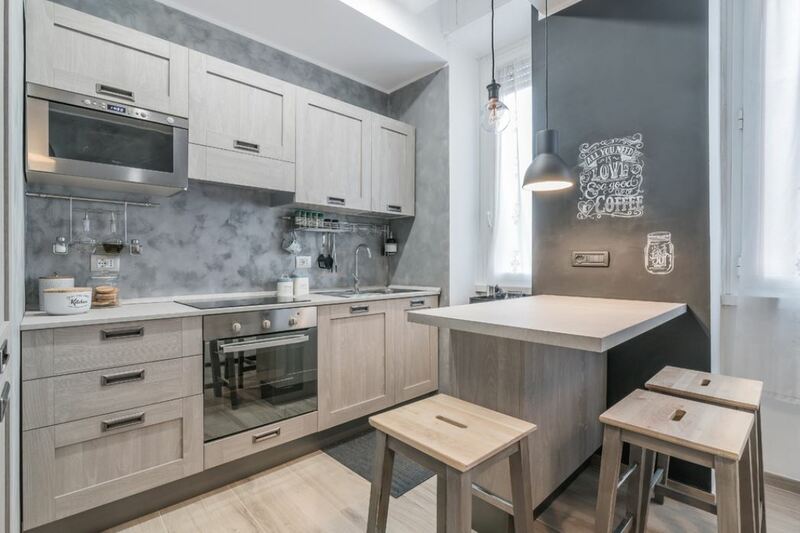 White and grey color tones make the kitchen look graceful. The red hanging lamp adds a bit of color and zing to it. The kitchen table stands symbolic to the warm ambiance of the kitchen. This is a simple kitchen set up that looks pleasantly spacious. Most of the available space has been intelligently utilized to build in cabinets for storage. The kitchen table offers a beautiful and cozy place for having breakfast to the occupants of the house. All these modular kitchen designs photos look quite helpful. 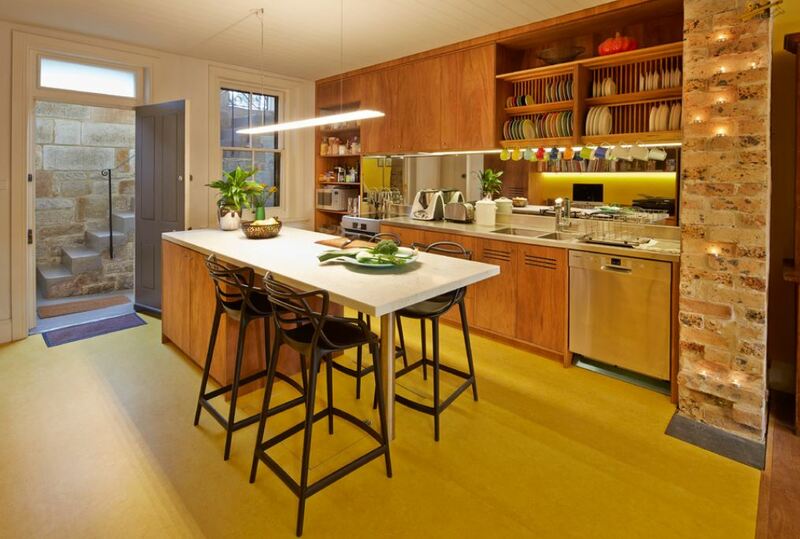 The vibrant color combination in this kitchen interior design rekindles warmth and affection in the atmosphere. Lighting and mirrors help to reflect all possible light into the room. The door and window towards the street allow daylight and cross flow ventilation into the room. I love this kitchen, it makes me feel happy. This large kitchen area has an interesting floor and wall combo in stone finish. The patterned accent wall adds more to the beauty. The glossy breakfast nook and the stylish chairs add more to the uniqueness. The array of cabinets offer lots of storage space. 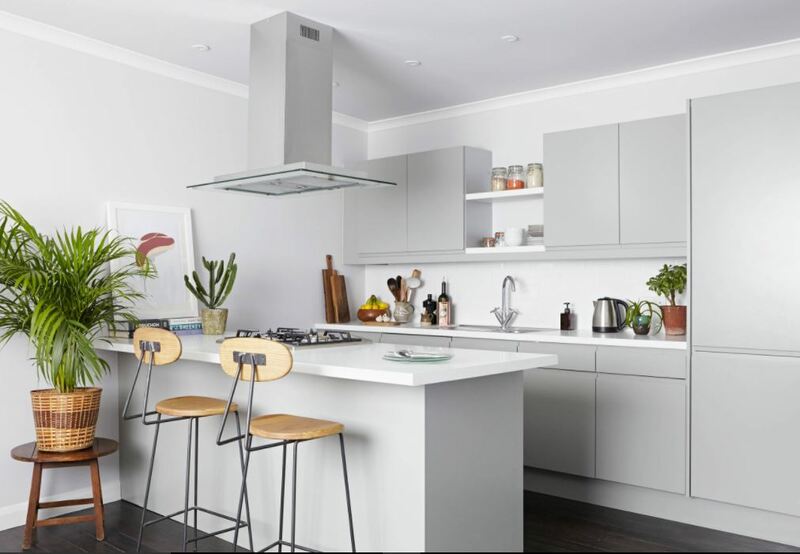 This entire kitchen is done in white and grey which gives it a simple yet stylish look. The feel is heightened by little splashes of green in those flower pots. The owner, it seems gives much importance to space management. The light grey storage unit suffices with the idea. A kitchen with panache, indeed! Each and every element in this kitchen epitomizes style. The wall art makes this place a little more interesting. 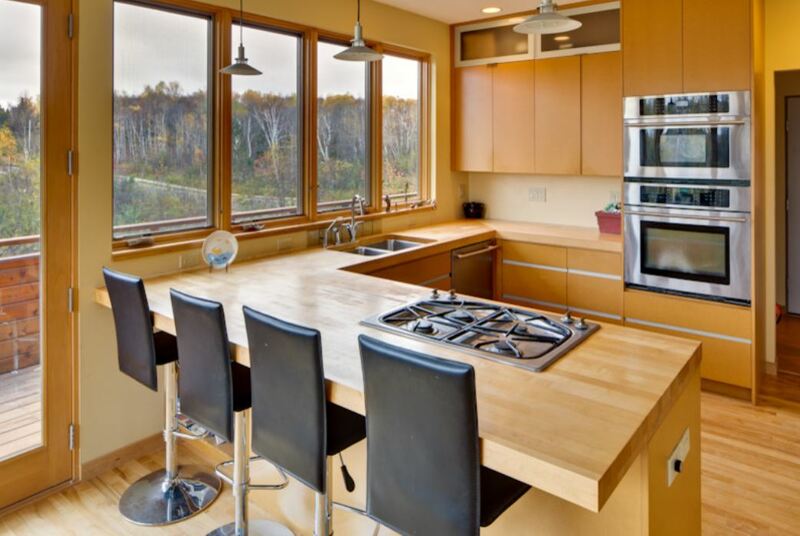 The large glass panels allow sunlight into the kitchen. Adding on to it, the owner has made fabulous lighting arrangement for the evenings. The dining area inside the kitchen speaks about the bonding within the family. Check out these modular kitchen designs photos for more ideas. 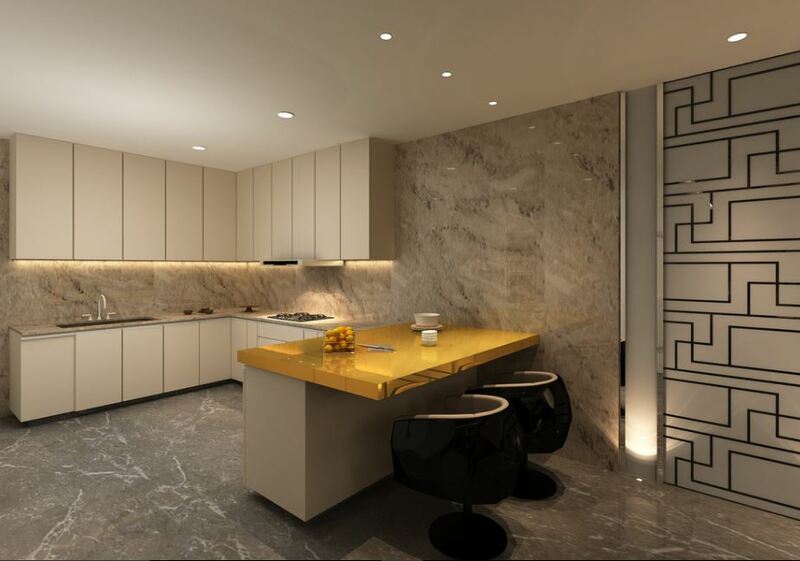 Here is a well designed kitchen area which offers room for all kinds of kitchen appliances. The big pull out drawers offer enough place for storage. 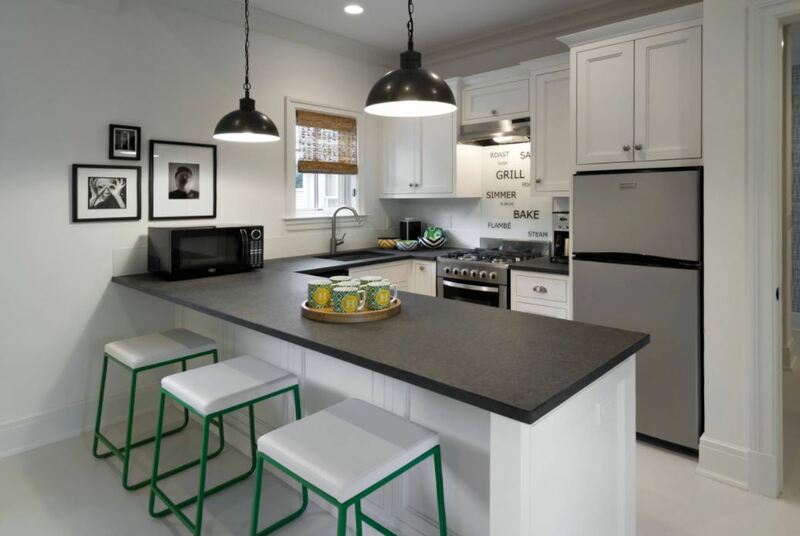 This kitchen boasts of a graphite island which is quite spacious. I like the backsplash and neatly tucked in stools beneath the island. The white countertop looks neat. The hob and chimney are placed intelligently between the cabinets. 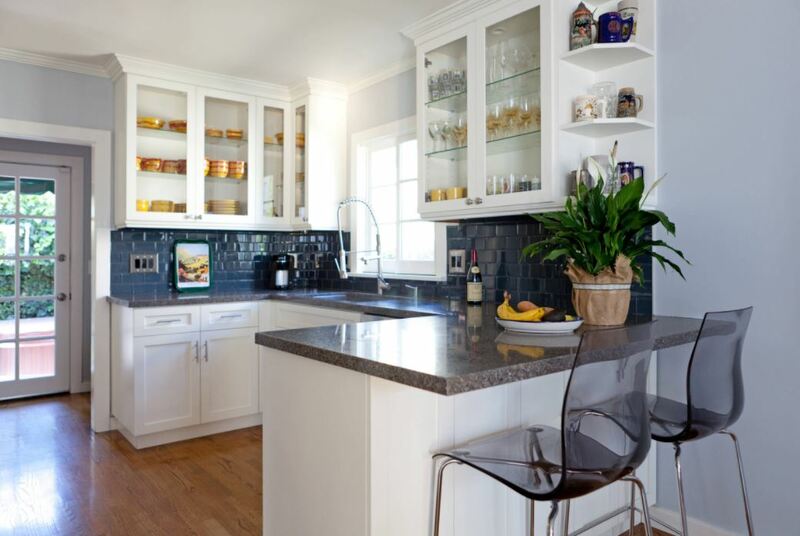 The floating shelves add to the beauty of the kitchen. All the appliances are fixed in the proper niche that is carved for them. This is a simple kitchen design with some interesting colors popping out here and there. 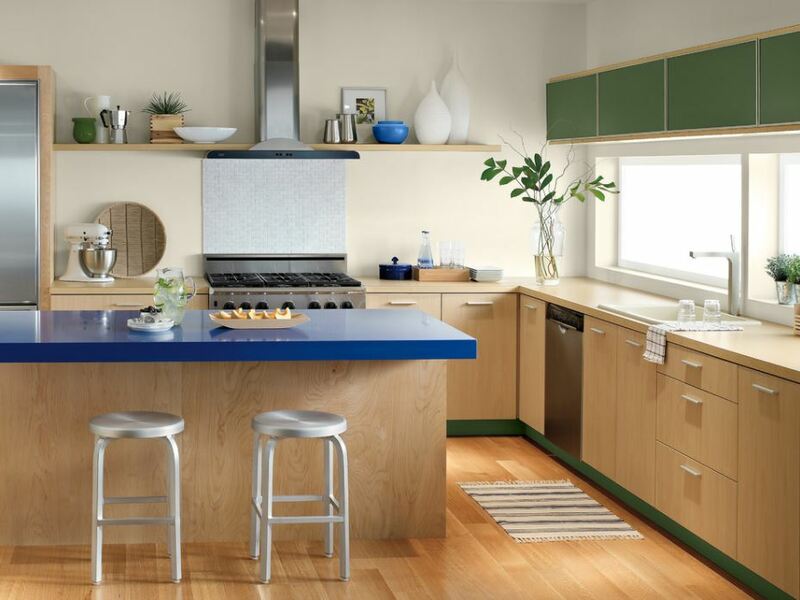 The bright blue countertop and green cabinet looks beautiful. The other colors stand in perfect blend with the blue and green color. The floating shelves at the level of the chimney hood create the magic. This entry was posted in Kitchen, Kitchen Designs and tagged Indian Kitchen Design, Indian Style Kitchen Design, Kitchen, Kitchen Design, Kitchen Design for Small Space, Kitchen Design Gallery, Kitchen Design Ideas, Kitchen Design Images, Kitchen Design Images Small Kitchens, Kitchen Design Layout, Kitchen Designs, Kitchen Ideas for Small Kitchens, Kitchen Tiles Design, Modular Kitchen Designs, Modular Kitchen Designs Photos, Simple Kitchen Design, Simple Kitchen Design for Middle Class Family, Simple Kitchen Designs, Small Kitchen Design Images, Small Kitchen Design Indian Style, Small Kitchen Design Layouts, Small Kitchen Design Pictures Modern, Small Kitchen Designs Photo Gallery, Small Kitchen Ideas on a Budget, Very Small Kitchen Design by Preeti Sinha. Bookmark the permalink. Modular Kitchen is a term used for the unbiased kitchen furniture layout consisting of modules of cabinets made of diversified materials which sustain accessories inside, which can facilitate the keen usage of the spaces in a kitchen.